Our Wine Club - A Few Spots Still Available! At Soaring Hawk Vineyards, because we are such a small-production winery, we have a small wine club. Our wine club members are greatly appreciated here at Soaring Hawk and have first priority to rare Soaring Hawk wines. Our wine club currently has a few spots open. If you would like to join our wine club, please come pay us a visit, send an email to us at winery@soaringhawkvineyards.com or give us a call at (805) 365-3000. Currently, Soaring Hawk wines can only be shipped within California. Our wine club members have priority access to Soaring Hawk wines. We send out alerts when inventory is running low on your favorite wines and we'll set wine aside to ensure we have enough for the next club shipment. Additionally, even though we are a small-production winery, we make several varietals and we strive to always include new releases in each shipment because we want to keep things interesting. Isn't "variety the spice of life," afterall? One unique feature about Soaring Hawk's Wine Club is that since we're so small, we are able to cater to our members! We let you decide what comes in your bi-annual shipment. We send an email announcement to our club members approximately one month before the shipment to let you know what the suggested shipment will be. You then have 2-3 weeks to get back to us with any requested changes in the line up - it's that easy! We want our club members to have their favorites! Soaring Hawk's Wine Club currently has a few spots available. We have to make sure we have enough wine for our members so we have to limit the number of memberships. 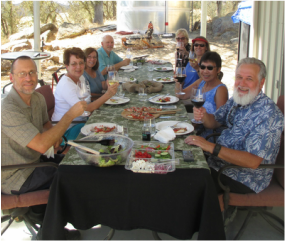 If you'd like to join our family of members, please send us an email at winery@soaringhawkvineyards.com or give us a call at (805) 365-3000 to be added to the happy member list.